Studio One is one of Jamaica's most renowned record labels and recording studios, having been described as "the Motown of Jamaica." Studio One was involved with most of the major music movements in Jamaica during the 1960s and 1970s, including ska, rocksteady, reggae, dub and dancehall. The label was founded by Clement "Coxsone" Dodd in 1954, and the first recordings were cut in 1957 on Brentford Road in Kingston. Amongst its earliest records were "Easy Snappin'" by Theophilus Beckford, backed by Clue J and his Blues Blasters, and "This Man is Back" by trombonist Don Drummond. Dodd had previously issued music on a series of other labels, including World Disc, and had run Sir Coxsone the Downbeat, one of the largest and most reputable sound systems in the Kingston ghettos. The label and studio were closed when Dodd relocated to New York City in the 1980s. 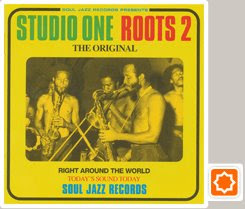 Studio One has recorded and released music by (and had a large hand in shaping the careers of) artists such as The Skatalites, Bob Marley and the Wailers, Lee "Scratch" Perry, Burning Spear, Toots & the Maytals, John Holt, Horace Andy, Ken Boothe, Freddie McGregor, Dennis Brown, Jackie Mittoo, Gladiators, Michigan & Smiley, Wailing Souls, Dillinger, Delroy Wilson, Heptones, Johnny Osbourne, Marcia Griffiths (of the I-Threes), Sugar Minott, The Abyssinians, Culture, Soul Vendors, Lone Ranger, and Alton Ellis. Noted rival Prince Buster began his career working for Dodd's sound system, and the record producer Harry J recorded many of his best-known releases at Studio One.